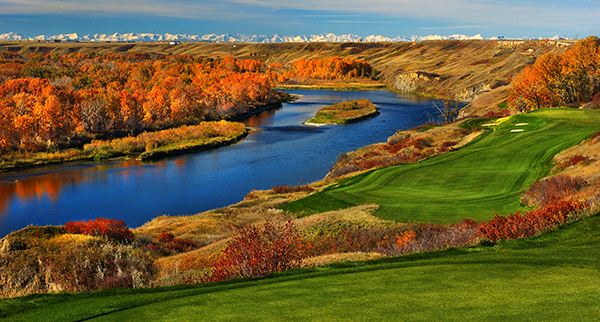 The banks of the Bow River offer some of the most spectacular scenery in southern Alberta, and it is in this inspired setting that is home to Speargrass Golf Course. Eighteen championship holes wind their way through the prairie, framed by native brush, trees, shrubs and grasses. Since its opening in 2003, Speargrass Golf Course has won accolades and acclaim as one of the top public courses in Alberta. Designed with vision by Gary Browning, the 6698 yard par 72 course offers guests of all abilities a challenging and highly playable experience. Only 30 minutes southeast of Calgary, Speargrass Golf Course has been recognized for its deceptively generous fairways and greens framed by strategically placed sand traps and water hazards. Speargrass offers an impeccably manicured links-style course with a choice of four teeing grounds on all holes. Yardage ranges from 5000 to 6670 yards, with slope ratings from 116 from the forward tees to a conservative 129 from the black tees. One of the course’s most unique features is that both the front and back nines each have 3 par threes, 3 par fours and 3 par fives. A challenging layout that offers a balance of comfort and complexity. I enjoy Speargrass because of the three par3-4-5s. Good to play with the wife, and good for a tournament as well. The tee boxes are set well so that the course will not beat you up provided you play the proper box. The course is always in excellent condition, is very playable and the pace of play is always very good! So nice to see friendly local staff working at your course. And the egg salad and tuna salad sandwiches are excellent!! Not as far from Calgary as you might think! Have enjoyed your course since it opened. I love the fact that it’s prime course close to Calgary with really reasonable rates. The grounds keepers always keep the course in pristine shape, which makes it that more enjoyable. The friendliness of your staff just shows that you value your customers and want them to return to play more. I will be coming back to play another time, plus I plan on telling all my golfing friends about your course. I love Speargrass for a number of reasons. The layout, the quiet location, and the fact that we always have fun there whether it be meeting up with family and friends or my stagette. The staff are friendly and easygoing too. Thanks for all the great times! Everytime I have played Speargrass, the staff has been extremely pleasant and helpful. Along with a great track to play on and a great par 3 by the river, I recommend this course to all my friends and play whenever I can get there. The thing I enjoy most about Speargrass is the totally Albertan feel to it. Having spent my summers as a youth on the farm I love playing holes along wheat fields and then just a few holes later playing along the river. An amazing course, in an amazing place. The diverseness of all the holes and the staff who are very helpful, professional and informative with their knowledge about golf and the course. My family has had the opportunity to golf on this amazing course and we enjoyed the course so much we are hosting my late brother’s first memorial golf tournament there this year. A must play for anyone in the area. Hope to someday get another chance to play there. I give your course a 5 star rating for many things.. the course itself is terrific and the people who work there were very friendly. This course, conditions and staff were the most beautiful and enjoyable golf I’ve ever played. I really enjoy playing there because of the difference between one side of the course to the other. I like that some holes are wide open and then it moves into the elevated tee boxes and then it moves out to the river bank, it's just fantastic! It is so nice to feel like you are getting away from everything and not be reminded by cars or houses of the world you left behind. Overall, Speargrass has the perfect blend of relaxed atmosphere and great golf, I can't wait to go back and play it again. This includes both the drive out and the golfing experience. It provides a much more relaxing experience than any course in the city. Always a pleasure on your course because of the variation in terrain and one of the few courses where I can't wait to play the next hole. Mixed with unbelievable golf and a golf course that is always in great shape. It has everything you could want in a golf course. It's a short drive to a day of great golf and wilderness. Speargrass is the only golf course I golf at. Great location, amazing course and great people working. Love the 15th hole, got my first eagle. One of the first courses to open and one of the last to close. Always in tiptop shape. Short but challenging. Great kitchen. No city noise!! Fantastic staff.